Heritage the Villa 3 is a three bedroom garden oasis located in the Domaine de Bel Ombre, in the south of Mauritius, where there a variety of luxury amenities and services as well as opportunities to explore the natural beauties present in the area such as the nature reserve. With a strong emphasis on top notch luxury service and stylish, modern, and comfortable interiors, a stay at the Heritage the Villa 3 will definitely be an unforgettable one. There are three guest bedrooms in the Heritage the Villa 3. With their clean and modern finishes, these bedrooms are sure to give you a much needed good night’s rest. These bedrooms also open onto a terrace, which gives the space an airy and light feel, adding to the space’s relaxing atmosphere. The bedrooms also come with en suite bathrooms. Heritage the Villa 3 is set in its own private garden paradise, in the beautiful Domaine de Bel Ombre. With a stunning infinity pool where guests can take a morning swim, all the while feeling one with nature as the beauty of the garden surrounds them. The outdoor area also has a gazebo and BBQ space perfect for some casual and fun evening dinners with friends and family. 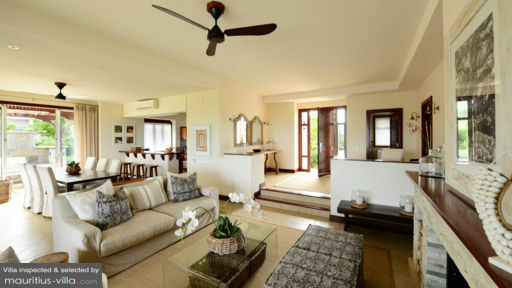 The living space here at Heritage the Villa 3 is cosy and light. Even if the lounge, dining, and kitchen area are all in the same area, everything feels adequately situated; you won’t feel cramped. This open plan living space also opens up to a veranda where the pool is close by and you can see the garden beyond. The staff here at Heritage the Villa 3 are not only highly competent but they are also invested in providing five star service to their guests. You’ll feel like you’re living in luxury here at Heritage the Villas with the e-concierge and 24 hour reception service. A golf court is also provided for you to move around the Domaine de Bel Ombre with ease. Guests can also avail of a private in-villa chef who can whip you up scrumptious meals, at extra costs. Here at Heritage the Villa 3, you’ll certainly feel pampered and spoiled. Heritage the Villa 3 is only a small portion of the 2500 hectare land that is the Domaine de Bel Ombre, a beautiful area with luxury hotels, a golf course, and a nature reserve. Guests of Heritage the Villa 3 have access to the various areas and amenities in the Domaine de Bel Ombre such as the C Beach Club, which has access to a private beach, swimming pools, restaurants, and various water sports. There are also various activities for kids such as mini golf, among others. Guests can also access the Heritage Golf Club, that has a championship golf course, and the two hotels, Heritage Awali and Heritage Le Telfair, which have a variety of restaurants and a spa village. The whole family will definitely have a wonderful time here.